Wearing Hanbok And Feeling Like Royalty | Chasing Life! I made a good friend with a professor’s wife whose name is Judy. She has two little girls, and a heart of gold. Judy heard that I wanted to wear Hanbok at some point during our visit. On our last day, she arranged a trip to a traditional village where we would meet with her friends and wear Hanbok. The plan was to walk around a park/burial site for royals, and take pictures. I was as excited as a little girl playing dress up minus the Barbie. Choosing Hanbok was challenging because there were many choices of colors and styles. I’m not even going to tell you how many layers of clothing I had on when all was said and done. I will just say this; thank God it was a cool day, otherwise I would have suffered a heat stroke under so many layers. Typically, hanbok runs the length of your body, and touches the ground. Unfortunately, we could not find one long enough for Brian. (Notice his robe in the pictures). We ended up getting him a King’s outfit. People would stop and look at us and laugh because Brian, unlike most Korean men, is a big guy with red hair – Not common in Korea! The kids, especially, got a kick out of the big king holding the camera (cuz you know, a king is not supposed to work…) Brian was definitely a good sport! There is not much inspiration I can give you about the Hanbok experience, other than to say it was therapeutic for me. I was starting to feel a significant decrease in my stamina after only four days of being in South Korea. I was nervous about ending up in yet another hospital, and I did not want anything to ruin my vacation. After choosing my Hanbok and going into a dressing room to change. I paused for a moment and took a deep breath. I got a little emotional, so I prayed and asked God for strength to be able to finish not just the day but the rest of the trip. I can’t begin to explain what is like to live in a constant state of stress about any future plans because of health issues. In my case, I have gotten used to things happening that are out of my control, quite often. It is hard to get excited about tomorrow when today is often uncertain. 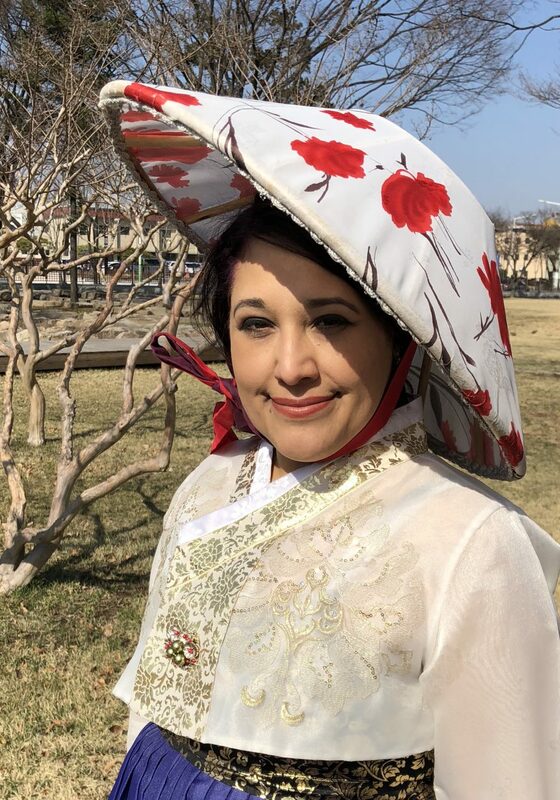 As silly as it may seem, wearing Hanbok was significant to me because Hanbok has been around for centuries. I think of it as somewhat ageless! Through time, much has changed in the country of South Korea. The culture has shifted and with it many social issues, religion, fashion, and politics, among other things. An interesting fact is that even today, you can be in any city of South Korea, and you will see people wearing Hanbok. Koreans still wear it for weddings, funerals, and other special occasions. You don’t have to look too hard to find a shop that will rent them to tourists or visitors to wear for the day. When I looked at myself in the mirror, I felt like I had stepped into the pages of history. Somehow, I felt like I had survived centuries just like Hanbok has. I know it sounds silly, but in a way it gave me hope. I felt like a true survivor. Here is a little disclaimer, I was not wearing an outfit that represented a queen or a princess. In fact, I think I was either a high society lady, a commoner, or a Gisaeng. Just imagine, Brian was the king of Joseon, who fell in love with a commoner. I would venture to say that Megan and Prince Harry got nothing on us! Come back for the next stop in my SK vacay. Next blogpost Daejeon and God Moments! Love the history. I think I’ve learn more by reading your blogs than what I did in history in high school. ???????????????? Thank you for sharing with us. Te amo??? ?